So me and Victoria from Victoria’s Vintage are going to Leeds Festival this year!! Woo hoooo! I’m making out like I haven’t mentioned it yet, but I have, many many times. I’ve been to Leeds around 8 times now and usually bag myself a free pass, but this year that pesky recession has stuck a stick in the gears and I wasn’t sure if I’d be getting one or not, so I’ve used my initiative and got Victoria in on the action and now we will be volunteering to work the festival with a company called Hot Box Events. We’ve had our shift pattern through now and we haven’t done too badly – working a Friday night shift, Saturday late and Monday morning, so we get pretty much every day off to enjoy the festival and can still party as much as we like when we’re not on shift! I figured even if it’s a bit rubbish we still have the experience for our CV’s too. The only ‘catch’ I guess is that 1, we WILL have to work and 2, we paid a deposit which is the same price as a regular weekend ticket, but we do get this back anyway, so not too bad really! In the spirit of realistic festival fashion, today we have a day to night outfit which is practical and makes the most of the limited room you have in your back pack. 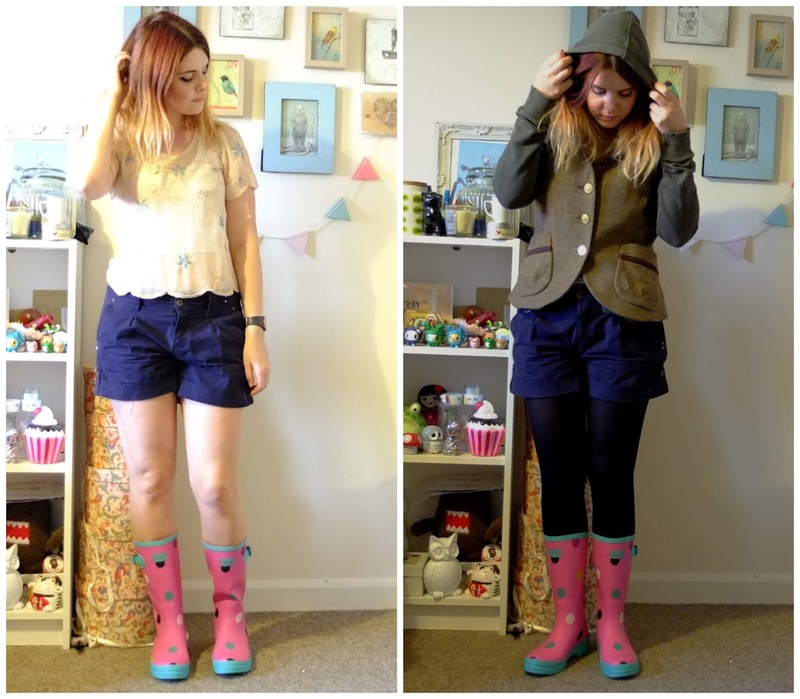 Shorts are the best thing really for festival’s no matter what the weather. If it’s cold you’re alright popping some leggings or tights on underneath, and if it’s warm you can go without and still look summery and stay cooler. They’re also better than playsuits and skirts when it comes to using the skanky toilets and portaloo’s, as with a playsuit you end up squatting completely naked and with a skirt you run the danger of accidentally dangling it in if you don’t hold it up properly after a few strong bows. Layers are your bezzy mate, because obviously with the weather being so unpredictable you don’t want bulky garments but you also want to keep as warm as possible. Something with a hood, something to keep warm, something for the sun, just think practicality over style and you’re away! 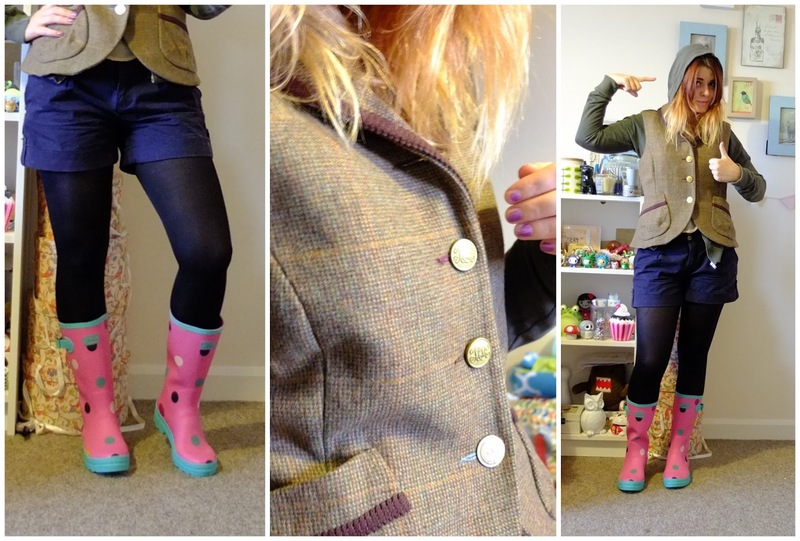 I got this tweed Joules gilet last year when they came to Keele University with one of their Big Sales, which are the most amazing thing ever – up to 70% off their beautiful clothing? Don’t mind if I do! 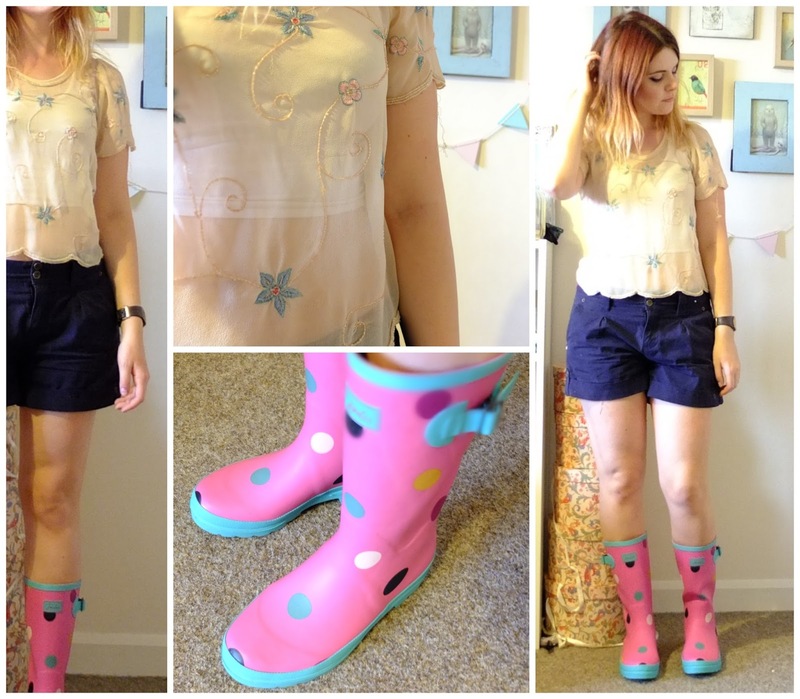 And you’ll remember the wellies from my last Festival Itinerary post. This gilet will not leave my back once the sun goes down I tell thee! The tweed makes it super warm, and even if it’s been a scorching hot day the nights get SO COLD, I’ll probably be sleeping in it too haha. Unfortunately I did buy it in a size 14 (as I read the label wrong) and which the Joules sale only being in town for the day I couldn’t take it back and swap it for a size 10! So I did shrink it a bit on a hot wash but I didn’t want to do it too much in case it ruined the material and felted it. It’s a shame, but luckily it still fits nicely when over something like a basic hoody. And speaking of sleeping arrangements, have you heard of The Lazy Camper? I spotted their stand at Wakestock festival when I went a few weeks ago and immediately had to contact them to find out more – it’s basically the best idea ever. You order your festival kit online and then they have it there waiting on their stand at the festival, meaning you don’t have to pratt about with carrying all the heavy stuff with you on your way there!! Because I got so excited they’ve sent me and Victoria a lovely package to review at Leeds which includes a tent for two, a sleeping bag each, inflatable mattresses, ponchos, torches and even chairs! They’ve thought of everything. I got this big bag from Home Bargains a few weeks ago and EVERYTHING apart from the chairs fits in perfectly, it’s just a shame they don’t have a stand at Leeds for us to pick it up from and we have to lug it there ourselves (but we really can’t complain!). So yes, the plan is me and Victoria carry the big bag one handle each (which I’ve reinforced with duct tape to be on the safe side) and then have maybe a back pack/wheelie case each and a little bag for our phones/money. I want to travel as light as possible as we still don’t know how we’re getting there, but I hate having too much luggage on public transport! *this post contains advertisement & gifted products.